Does Ghee Make Me Fat? Hey Monica! I KNOW that ghee is one of your first recommendations to cure constipation but I am AFRAID to eat ghee. I know it is clarified butter and that just says cholesterol and weight-gain for me. You said that you won’t gain weight from ghee, etc. Why is that since it is butter? What about cholesterol? GREAT question and thank you for bringing this up. 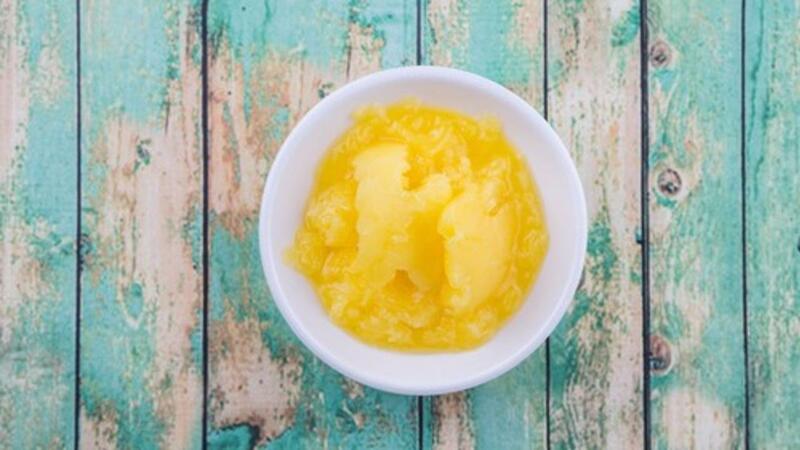 Certainly you are not the only person who wants to know, "Does ghee make me fat?" Raise your hands if it has crossed your mind that eating ghee will make you gain weight. Look around the room, see? You're not alone. Leave your hands up if you are a vata. Ah-HAH, just as I thought. See, vatas always ask the, "Will it make me fat?!" 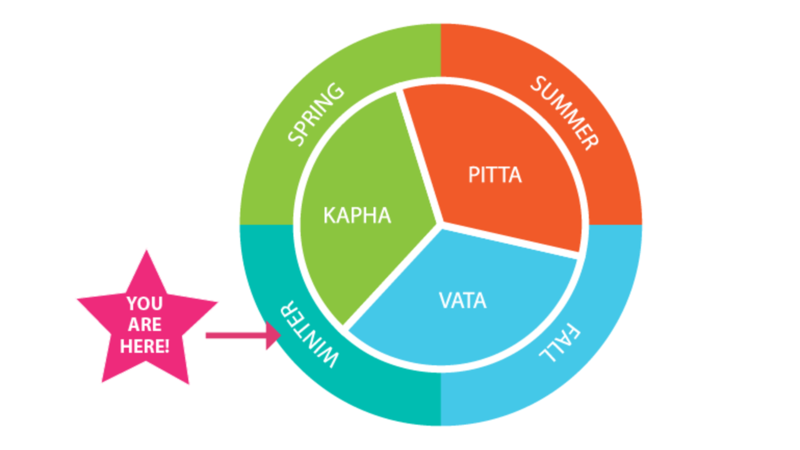 question and the irony is that vatas are the dosha least likely to gain weight no matter what they eat. Vatas need extra fat to keep their structure built, yet they are the dosha most paranoid about eating them. We are governed by the five great elements, right? Right! Space, air, fire, water, and earth. Well, from those five elements are created the three doshas. I even made a handy dandy little printout for a visual aid ;) Check out the video or transcripts below. 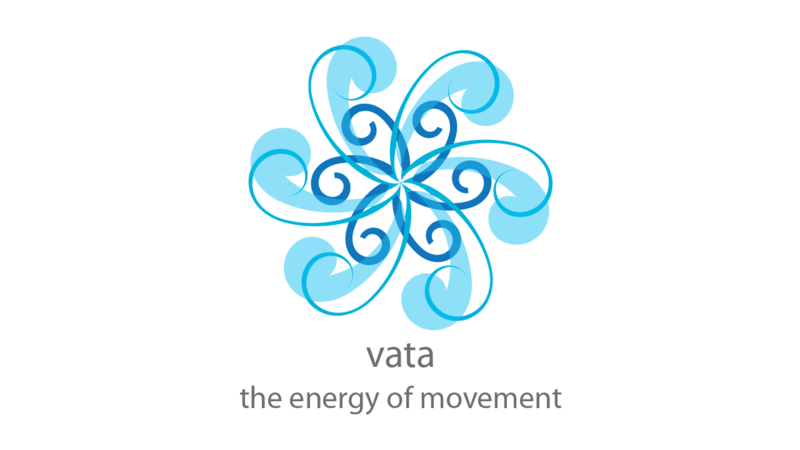 Vata is the energy of movement. If you think about space and air, it's very, very subtle, and it moves very quickly, right? Space is the container where things are created. Space is also, in proper Ayurveda, it is ether. It is not just nothing. It is not a space of nothing. It's a subtle gas, and with a space and a subtle gas, there are things that can be created within that space, right? Just a little tip for yourselves. If you are ever in a space where you can't get any creativity or just like, "I don't know why I'm so blocked, I don't have any creative ideas," slow everything down. Things are only created when there's space to do so. I got a question from Jessica! Jessica wants to know, "Monica B., what do we do when we have a wonky schedule sometimes? And what if it's just consistently wonky?" Jessica is home with her two year old all day and then she works in a movie theater at night. Sometimes she works at night and sometimes she doesn't. Sometimes she works until 11:00 o'clock at night and sometimes at 1:00 in the morning, depending on the schedule, depending on what's showing at the theater. So everything is a little bit wonky. I have 4 things things that I suggested to keep her balanced amidst the wonky schedule. You can use these too, to keep yourself healthy and in optimal flow with the day. #1 Stick to the Ayurvedic daily routine the best you can. 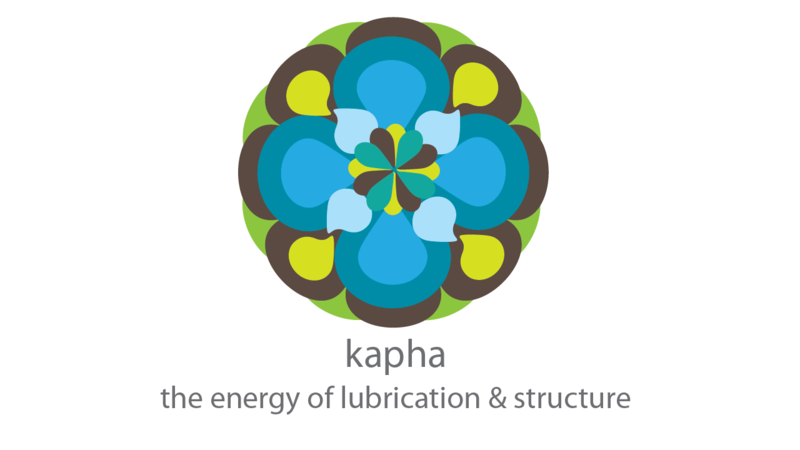 Kapha is the dosha responsible for lubrication and structure of the body. Because of their sturdiness, Kapha people tend to be the healthiest of the three doshas, including mental health. Kapha is our lubrication in the brain, around the joints, reproductive fluids, and is responsible for building most of our tissues. Kapha keeps our bodies from turning into raisins. Since Kapha people are made of water and earth they are very sturdy, grounding and they are difficult to move. They are comfortable and happy in one place and don't like change. Kaphas are prone to "static & heavy" diseases like obesity, lethargy, dullness of mind, and diabetes. To begin changing your life with Ayurveda, grab a copy of my book In Your Elements on Amazon! According to Ayurveda, all that exist in the Universe (and planet earth, down to our teeniest cells) are 5 things: space, air, fire, water, earth. As those 5 things combine in a gazillion different ways, we end up with mountains and dining room tables (lots of earth element), oceans and cups of tea, (lots of water element), bon fires and candles (fire, duh), and wind (our breath!) as a few examples. So these 5 elements combine to create our material world. Therefore nature is part of us and we are part of it. In Ayurveda, this is the principle of macrocosm and microcosm: the large nature (great universe!) and the tiniest nature (our cells) are made of the same things! So let's go a little further. At conception we were created with a unique blend of the 5 great elements (space, air, fire, water, earth). Below is an excerpt from my book In Your Elements, available on Amazon. A kitchari (KIT-cha-ree) cleanse is a mono diet to nourish and reset the digestive system. Simply commit to 3–7 days for the cleanse. How do you know if you need a kitchari cleanse? If you feel emotionally depressed, physically heavy, have any symptoms of ama, or are just not feeling like yourself, a kitchari cleanse will do you a world of good. You know yourself better than anyone else, so you be the judge of when you need it. This can be done any time. Kitchari is a traditional Indian dish made of digestive spices, basmati rice, mung dahl and veggies of your choice. It’s a staple in Indian households to accompany many dishes. 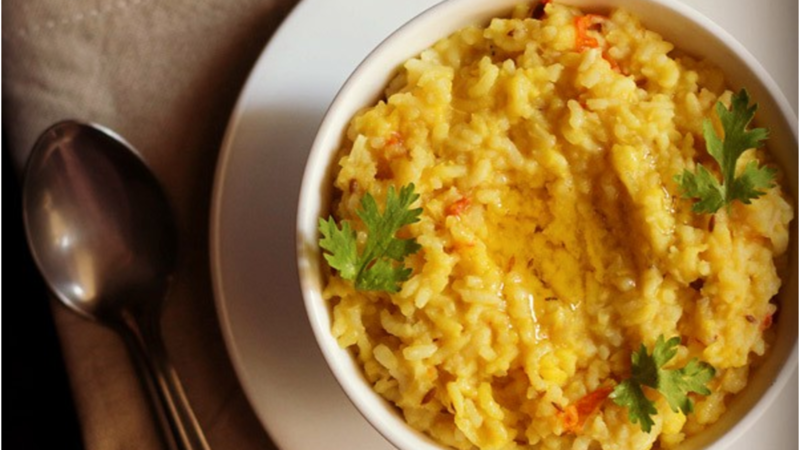 If a food could wrap you in a cozy blanket, it would be kitchari. 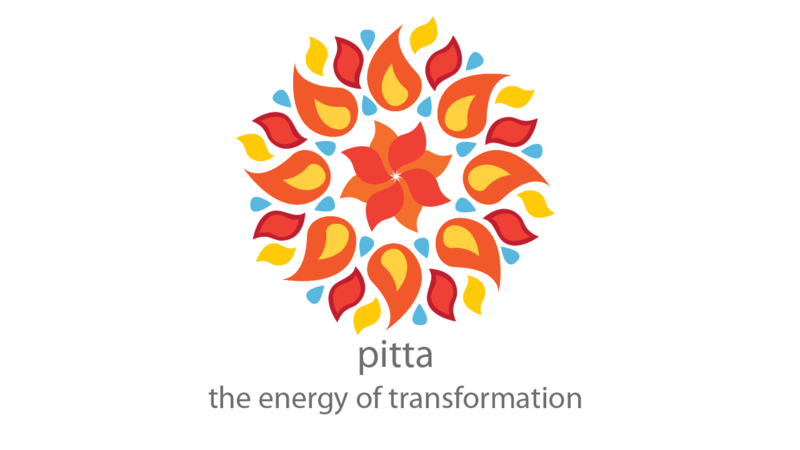 In Ayurveda, Ritu Sandhi means the "joining" of seasons. You say it like this: RIH-doo-SAHN-dee. When the seasons change, there's a period of transition. Think of it like a gap or a joint between the seasons. When the seasons change, we are susceptible to sickness because the doshas that rule the season are also changing. Therefore we have to adjust our eating and lifestyle routines from one season to the other as a transition. Our bodies have been used to the routine, food, and lifestyle of the last season and without some prep work, switching to a new season immediately is a shock to the system which affects our immunity. Let me break it down for you so you can see how all this works. 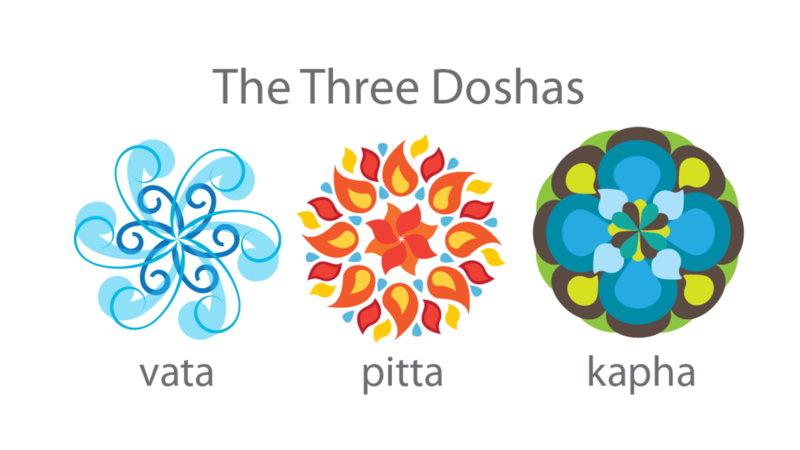 In Ayurveda, the three doshas govern specific seasons. Listen to the mp3/audio HERE. Find more videos on my YouTube channel. Alrighty. Let's talk about the Ayurvedic daily routine! We know doshas rule our bodies, but they also rule nature and the universe in the way of time and space. We are tiny bits of this big nature that surrounds us, so when we go in accordance with nature, we will function at our best. 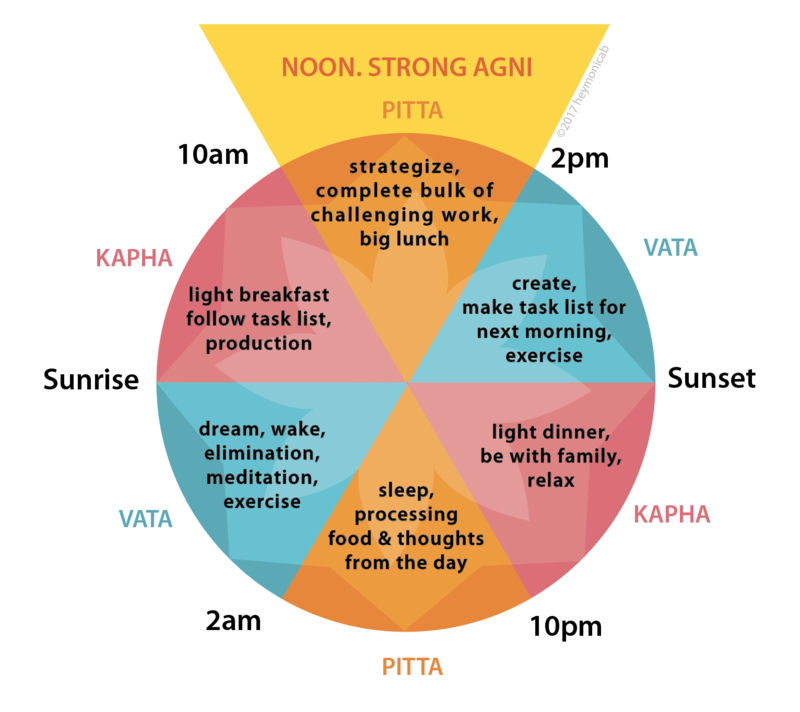 This daily routine will help guide you as to which energies (doshas) govern which times of day. Doshas rule certain times of day, seasons, and stages of life, so once we know what energies are strongest at specific times, we can go with the flow of those energies to achieve overall balance. See the chart below. Study it for a sec. Ok, now I'll go into detail about the Ayurvedic daily routine.